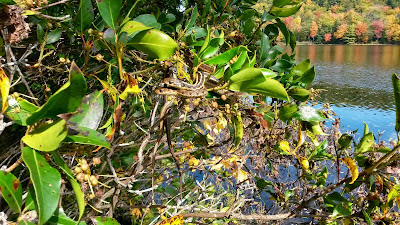 Several weeks ago, as I was sitting by Upper Spectacle Pond having lunch and enjoying the sunshine, I happened to look up in the laurel bush beside me. 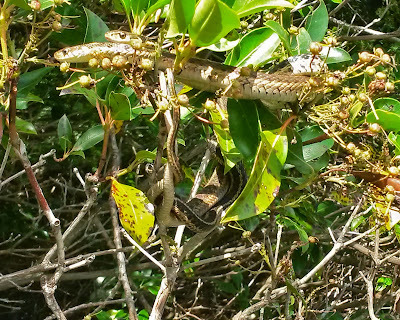 There I saw two entwined garter snakes draped on a branch. I was surprised and intrigued. While I have often seen garter snakes on the ground, I have never seen them in a bush. I watched them throughout my lunch. Was this mating behavior? their bodies moving slowly, twisting and undulating somewhat. "It’s not all that rare to see garter snakes in vegetation, but twined together like that is definitely unusual. Garter snakes mate in the spring, and because the male releases both male and female pheromones, he attracts lots of other males, and they form what is called a “mating ball” with up to 100 males writhing around one poor female. But the season isn’t right for that. Young garter snakes are born in the late summer or early fall (up to late September) and they do tend to stay together for a while, but it looks like at least one of the snakes in your picture is of good size. I find it very interesting, and hope, if you find a herpetologist that can explain this behavior, you’ll let me know what’s going on!" "Very interesting. This certainly looks like courtship behavior. Sometimes animals don't follow the rules and breed at different times of the year than usual. This is the best answer I have." So, once again, I am learning something new! By-the-way, in 2007, the garter snake was designated as the official reptile of the Commonwealth of Massachusetts. A little love in the afternoon!